Because of its elegant design and stunning exquisiteness, curved staircases always draw people’s attention. 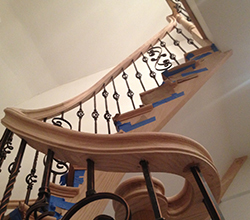 At Second Generation Wood Stairs, we manufacture and install custom designed curved stairs for our clients. We are known for our unique design of curved staircases, which are visually attractive and strong. We can build these stairs most anywhere in the house, whether near walls or free standing. We have an expert and accomplished team of professionals, who can provide you with quality, uniqueness, and long lasting results. 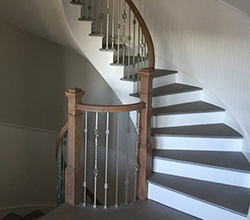 Our clients’ can choose from a large variety of wood for their stairs, as we build stairs from different types of wood like; Cherry, Brazilian cherry, cherry, mahogany, maple, poplar, oak, Santos mahogany and many more. We use computer-aided designs.We have worked with some of the most renowned builders, interior designers, and architects in order to provide our clients with the best in stairs. We also give top priority to our client’s opinion and expectations on railing styles, wood and the overall appearance of stairs. 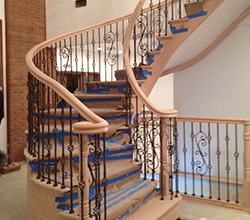 We make sure that your curved stairways compliment your house’s interior design, and budget. 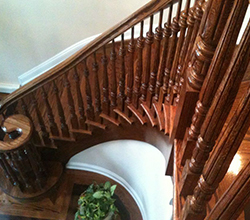 Curved staircases have much more than a just a decorative aspect. We also make sure to meet any building codes that apply, while constructing the stairs for your home. Give us the opportunity to show you the real beauty of curved steps!